Dental Implant Teeth Options: this page is designed to give people an idea of their options to replace missing teeth when using Dental Implants. We use the very best Dental Implants available, to achieve a lasting solution. There are many types available, but the design of Ankylos ticks all the right boxes for our patients, and us. 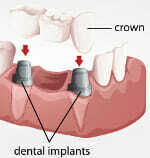 As well as the implants themselves, we design and craft the individual Tooth Crowns. As well as the normal colour matching and getting the dimensions exactly right, we will advise on the options available for a combination of being built to last and achieving that perfect look. Choose from a range of systems and materials. We will always talk through the decisions and have a look at some examples when you come to see us. 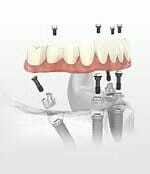 Simply, where multiple replacement teeth are supported by an Implant at either side, we would call this a Dental Implant Bridge. In any situation where it is possible to support more teeth with less implants, it reduces costs, making the dental implant bridge a very good option for either a few missing teeth or full arch replacements, with more options below. As you can see, the partial fixed dentures are supported purely by the implants, and not by adjoining teeth (better than the ‘old’ bridges by a mile). Prices will vary according to the number of teeth and position. Dentures have always been cost effective, and have improved immeasurably in recent years. By retaining removable dentures with Dental Implants it gives that best combination of cost and performance, but with greater stability. The stability effect is ‘not just’ improving the comfort and ability to eat and enjoy a wider range of food, but the confidence gained through what we think are now great looking replacement teeth. 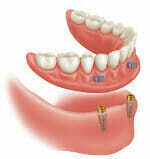 Implant retained dentures start from £2,195 plus 2 fitted implants for the lower jaw, or 4 for the upper jaw. The range of options for full arch replacement teeth seems to grow daily, and they get better all the time. New systems such as All on 4, and a growing number of immediate dental implants systems allow us to deliver Teeth in a Day, a transformational experience. The Acrylic material are more flexible, forgiving and more easily repaired than porcelain, useful during the time people are getting used to them. Most full mouth teeth replacement patients would start with these. This is a set from an existing patient of ours, don’t they look great? For the full aesthetic appeal, then there simply is nothing better thant Porcelain, fixed implant teeth, hand finished, layer by layer by our master ceramicists. 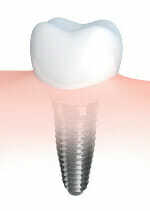 Many patients will start with Acrylic Implants for the first few years, live with them (they look great don’t they? ), and then make the decision to replace with Porcelain some time in the future.